Warner Bros.' and director Alan Crosland's The Jazz Singer (1927) is an historic milestone film and cinematic landmark. [Note: Most people associate this film with the advent of sound pictures, although Don Juan (1926), a John Barrymore silent film, also had a synchronized musical score performed by the New York Philharmonic and sound effects using Vitaphone's system.] It should be made clear that this film was not the first sound film, nor the first 'talkie' film or the first movie musical. The wildly successful "photo-dramatic production" was based upon Samson Raphaelson's 1921 short story "The Day of Atonement" (also the basis for Raphaelson's popular 1926 Broadway play of the same name), and adapted for the screen by Alfred A. Cohn. In 1926, Warners' risky investment of a half million dollars with Western Electric in the Vitaphone sound system brought profits of $3.5 million at the box-office with this landmark talkie. It was a huge success, responsible for transforming Warners into Hollywood's hottest film factory. The commercialization of sound-on-film, and the transformation of the industry from silent films to talkies became a reality with the success of this film. Although it was not the first Vitaphone (sound-on-disk) feature, it was the first feature-length Hollywood "talkie" film in which spoken dialogue was used as part of the dramatic action. It is, however, only part-talkie (25%) with sound-synchronized, vocal musical numbers and accompaniment. [Note: The first "all-talking" (or all-dialogue) feature-length picture was Warners' experimental entry - the gangster film Lights of New York (1928).] There are only a few scenes, besides the songs, where dialogue is spoken synchronously. A musical score (composed of a potpourri of melodies including sources such as Tchaikovsky, traditional Hebrew music and popular ballads) and musical sound effects accompany the action and title/subtitle cards throughout the entire film. The characters are given individual musical themes. [Note: Jolson was actually promoting the title of one of his songs, You Ain't Heard Nothin' Yet (written by Gus Kahn and Buddy de Sylva), that he had recorded in 1919.] In fact, Jolson's next part-talkie follow-up film, Warners' and director Lloyd Bacon's The Singing Fool (1928), was an even greater hit and a superior film. This next film contained the first hit song from a talking movie, Jolson's Sonny Boy. A Jolson biopic from director Alfred E. Green was titled The Jolson Story (1946), starring Oscar-nominated Larry Parks as the wildly-popular entertainer (rather than Jolson, who also auditioned to play himself). 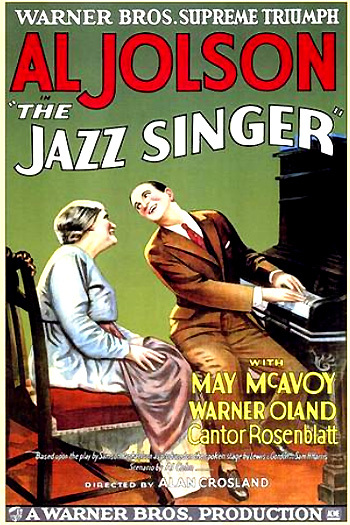 Star Parks received the nomination, although Jolson did the actual singing for the part. And then there was a sequel, Jolson Sings Again (1949). Although the film was ruled ineligible in the Best Picture category (it was thought unfair for a sound film to compete with silents), Warner Bros.' production head Darryl F. Zanuck was presented with a special Oscar at the very first Academy Awards ceremony in May of 1929, "for producing The Jazz Singer, the pioneer outstanding talking picture, which has revolutionized the industry." The film had two nominations in two other categories: Best Writing Adaptation (Alfred Cohn), and Best Engineering Effects (Nugent Slaughter), but didn't win. The film was remade twice: Warners' and director Michael Curtiz' The Jazz Singer (1952) with Danny Thomas (as Jerry Golding) and Peggy Lee (as Judy Lane), and director Richard Fleischer's The Jazz Singer (1980) with singer-songwriter Neil Diamond in the lead role as the cantor's son with legendary co-star Laurence Olivier as his father. The New York Ghetto, throbbing to that rhythm of music which is older than civilization. Immigrant life in the lower East Side of the New York Ghetto is seen on location around Hester and Orchard Streets. Bearded Jewish Cantor Rabinowitz (Warner Oland) wishes his son to continue in the five-generation family tradition and become a cantor (a leader of chants and songs during Jewish religious services) at the Orchard Street synagogue: "Cantor Rabinowitz, chanter of hymns in the synagogue, stubbornly held to the ancient traditions of his race." But he cannot locate his young son: "Tonight Jakie is to sing Kol Nidre. He should be here!" His mother, Sara Rabinowitz (Eugenie Besserer): "God made her a Woman and Love made her a Mother," is more sympathetic: "Maybe our boy doesn't want to be a Cantor, Papa - " Cantor Rabinowitz can't believe that his boy would turn his back on family traditions: "What has he to say? For five generations a Rabinowitz has been a Cantor - - he must be one!" Young Jakie Rabinowitz (Bobby Gordon as a 13 year old boy) has forsaken the ways of his fathers to try out show business. This results in conflict between devotion to his family and his deep love for worldly jazz music. Inside Muller's bar-cafe, young Jakie prefers singing popular songs of the day, and is introduced by the piano player: "Ragtime Jakie is with us - give him a break." In the first actual synchronized sound heard in the film (not by Al Jolson!, but by young Bobby Gordon), Jakie entertains the cafe audience by singing 'My Gal Sal.' From the beer-garden area of Muller's, "Moisha Yudleson (Otto Lederer), rigidly orthodox and a power in the affairs of the Ghetto" spots the young Jewish boy singing, and runs to tell Jakie's father. In the Rabinowitz home, Sara is told by her husband: "I have taught him all the hymns and prayers - - he knows them as well as I do." Sara understands where the boy's heart lies: "Yes Papa - he knows all the songs - he has them in his head - - but not in his heart." Jakie's father points to his watch: "He will start the fasting of Yom Kippur without supper." Yudleson brings the news: "In a saloon, who do you think I saw singing raggy time songs? - your son Jakie!" His father is furious to find his son in the beer-garden performing 'Waiting for the Robert E. Lee,' rather than in the synagogue. He snatches the squirming boy from the stage to drag him home by the scruff of the neck. Jakie hugs and embraces his mother for protection from his threatening father: "I'll teach him better than to debase the voice God gave him!" Sarah tries to reason: "But Papa - our boy, he does not think like we do." Papa wishes to teach the boy a lesson: "First he will get a whipping!" Jakie's stern father prepares for the whipping by removing his belt, despite protestations from Sara. Jakie threatens: "If you whip me again, I'll run away - - and never come back!" Outside the door, Sara reacts horribly to the sounds of her beloved boy being brutally whipped in the bedroom. With one last embrace and kiss from his mother, Jakie carries through on his threat, rebelling against his father's wishes and running away from home. Even though he has lost his son, Cantor Rabinowitz prepares for the evening's service: "It is time to prepare for the services, Mama." Mama is distraught: "Our boy has gone, and he is never coming back." At the synagogue on Yom Kippur, Rabinowitz tells another Jewish cantor: "My son was to stand at my side and sing tonight - but now I have no son." The Kol Nidre is sung in the synagogue, during which time Jakie sneaks back into his home and retrieves a picture of his loving mother. Jakie Rabinowitz had become Jack Robin - - the Cantor's son, a jazz singer. But fame was still an uncaptured bubble - - ... Al Jolson. Jack is invited to perform in the nightclub and is introduced to the crowd: "Jack Robin will sing 'Dirty Hands, Dirty Face.' They say he's good - we shall see." Jack tells his table companion: "Wish me luck, Pal - I'll certainly need it."